For anyone with sinus and allergies you know how much of a pain these conditions can be! Add to that asthma and you have a winning combination... Hmmm well I guess winning wouldn't be the word to use here, more like annoying. I am that person who has all 3! Getting a cold always feels like death, my hubby thinks I fake how sick I feel. I wish he would realize it stinks not being able to take a deep breath. Plus 80% of my colds turn into a sinus infection :(. Sometimes I spend hours just trying to open up my nasal passage. Warm showers help, certain essential oils also help and I have even used heating pads on my face to relive pressure. These are things I do when I am sick. I use my humidifier to keep me feeling good all the time though. Those 3 things may amplify when I am sick, but they are always there. And I just found out I may have been making myself sicker by not cleaning my machine properly! With cold and flu season in full swing many people are being told by their doctors to pull out their humidifiers to help get a more restful sleep, but could your humidifier actually make you sicker? It is true, running your humidifier without properly cleaning it can cause issues that can make you even more sick and may cause long term issues with your lungs. Most companies recommend that you throughly clean your humidifier every 3 to 4 days, but when you are sick it tends to be the last thing you want to do at night. A new company called Nixall has the solution to do the job for you. Nixall PH Balanced Cleanser allows you to put a cup and a half of its cleanser into the humidifier each time you fill it. This will clean the stale mildew air and leave the room feeling fresh. 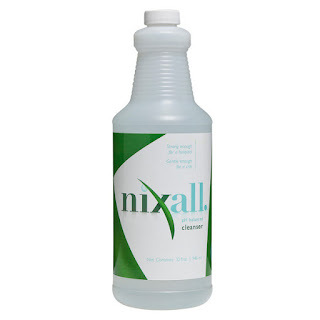 Nixall Cleanser has a vapor containing hypochlorous acid which cleans the humidifier. It makes so much sense! How can I clean my air with a dirty device? I have been using it for a few days and even though I can't really test my own air it does seem to smell different. Which I am going to take as a good sign.